Coolidge Hall, also known as Coolidge Tower, is a skyscraper in Amherst, Massachusetts that is built in the modernist style. It is named after former state governor and President of the United States Calvin Coolidge. It is part of the Southwest Residential Area at the University of Massachusetts Amherst. When was built, it was known as the Southwest (North) Dormitory I. The building is also among the five top tallest dorms at the university and the Umass system. John Adams Hall, also known as John Adams Tower, is a skyscraper in Amherst, Massachusetts that is built in the modernist style. It is named after former vice president and President of the United States John Adams. It is part of the Southwest Residential Area at the University of Massachusetts Amherst. When was built, it was known as the Southwest (South) Dormitory I. The building is also among the five top tallest dorms at the university and the Umass system. John Quincy Adams Hall, also known as John Quincy Adams Tower, is a skyscraper in Amherst, Massachusetts that is built in the modernist style. It is named after former President of the United States John Adams. It is part of the Southwest Residential Area at the University of Massachusetts Amherst. When was built, it was known as the Southwest (South) Dormitory III. The building is also among the five top tallest dorms at the university and the Umass system. 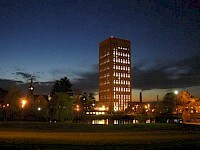 The John W. Lederle Graduate Research Center, also known as Lederle Tower, is a skyscraper in Amherst, Massachusetts. It is part of the University of Massachusetts Amherst. It contains graduate research rooms on the upper floors as well as the offices of some of the science departments. The lower floors contain classrooms. The building is also connected to the Lederle Lowrise and other surrounding buildings through skyways. Kennedy Hall, also known as Kennedy Tower, is a skyscraper in Amherst, Massachusetts that is built in the modernist style. It is named after former senator and President of the United States John F. Kennedy. It is part of the Southwest Residential Area at the University of Massachusetts Amherst. When was built, it was known as the Southwest (North) Dormitory II. The building is also among the five top tallest dorms at the university and the Umass system. Murray D. Lincoln Campus Center, is a skyscraper in Amherst, Massachusetts that is built in the modernist style. The building also hosts The Campus Center Hotel on the upper floors of the building. The hotel consists of 116 rooms. Southwest (North) Dormitory III, was a planned skyscraper in Amherst, Massachusetts that was to be built in the modernist style. It was cancelled in favor of low rise buildings after it was determined that there was a lack of funds available and students didn’t like the idea of commuting to the ground floor of the tower. The W. E. B. Du Bois Library is one of the three libraries of the University of Massachusetts Amherst in Amherst, Massachusetts (the others are the Integrated Sciences and Engineering Library and the Music Reserve Lab). The library is the main campus library with resources primarily humanities and social and behavioral sciences. At 26 stories and 296 feet (90.32 m) tall, it is the tallest library in the United States and the 23rd-tallest educational building in the world. Washington Hall, also known as Washington Tower, is a skyscraper in Amherst, Massachusetts that is built in the modernist style. It is named after former military commander and President of the United States George Washington. It is part of the Southwest Residential Area at the University of Massachusetts Amherst. When was built, it was known as the Southwest (South) Dormitory II. The building is also among the five top tallest dorms at the university and the Umass system.